It's that time of year folks! 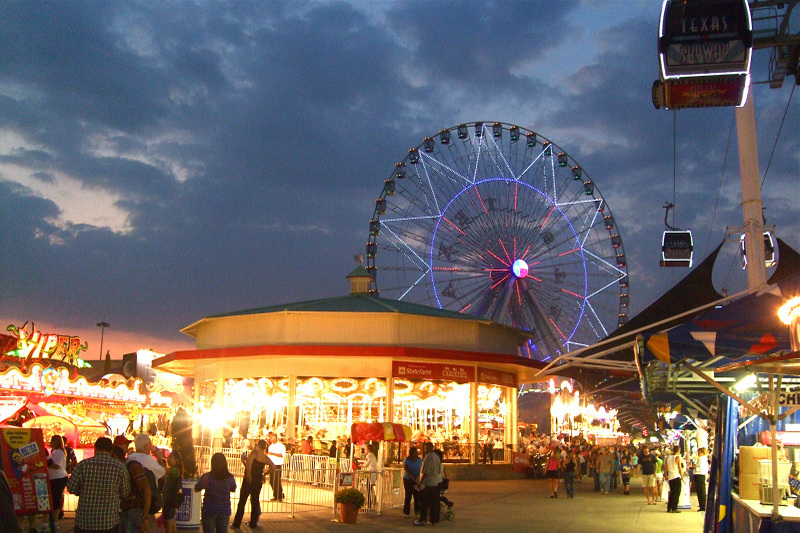 Over the next 24 days, visitors will spend almost $30 million at the 200 food service locations throughout Fair Park. Might as well get started! 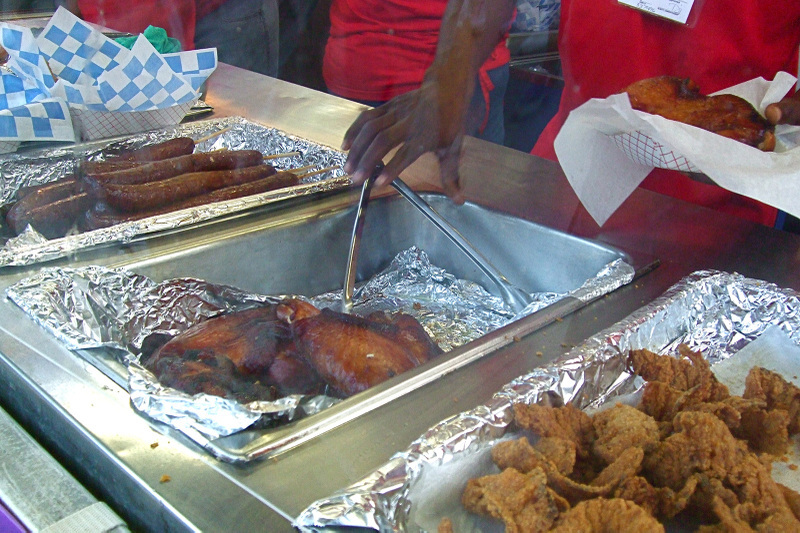 Couldn't wait to hit the Fletcher's stand…this year I started with the jalapeño/cheese variety. 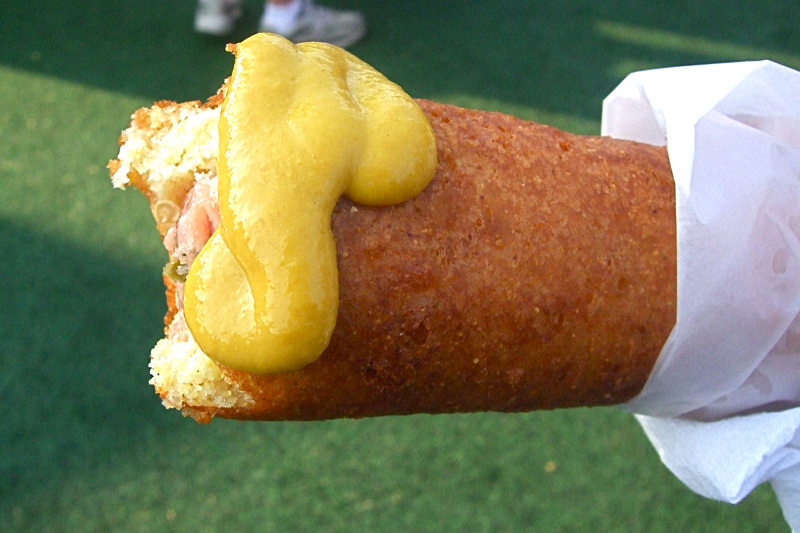 I just stand by the mustard dispenser and squirt a fresh glop on each bite…yummm. 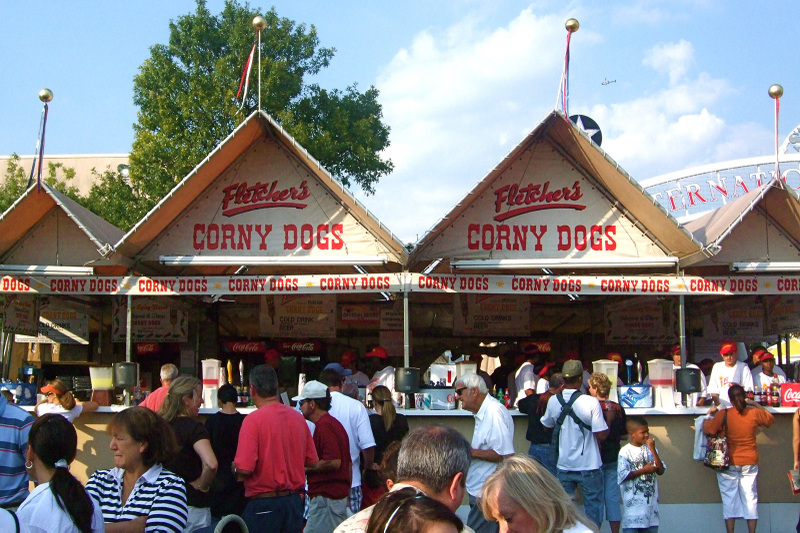 Of course, Corny Dogs were invented in 1942 by State Fair concessionaires Carl and Neil Fletcher. 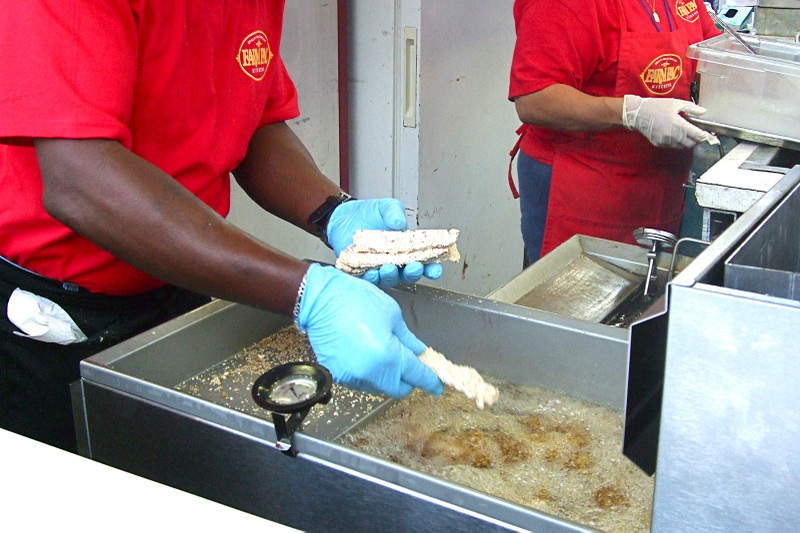 No time to 'waist' – on to the fried stuff! 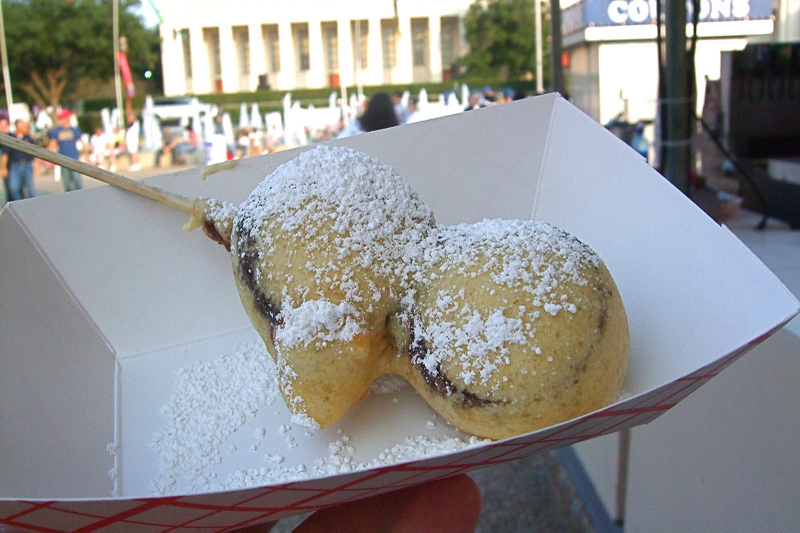 ^ Here we have some fried cookie dough… mmm hmmm. 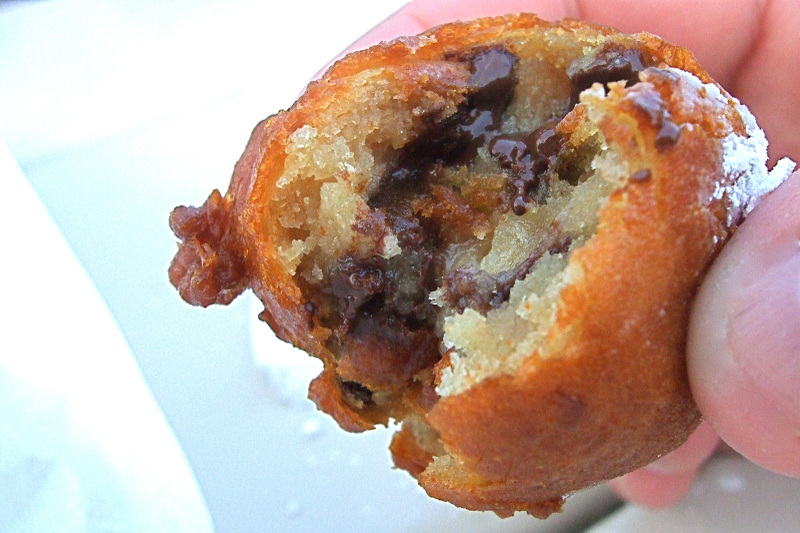 ^ OK, we REALLY liked these Waffle Balls (yeah… who knew). 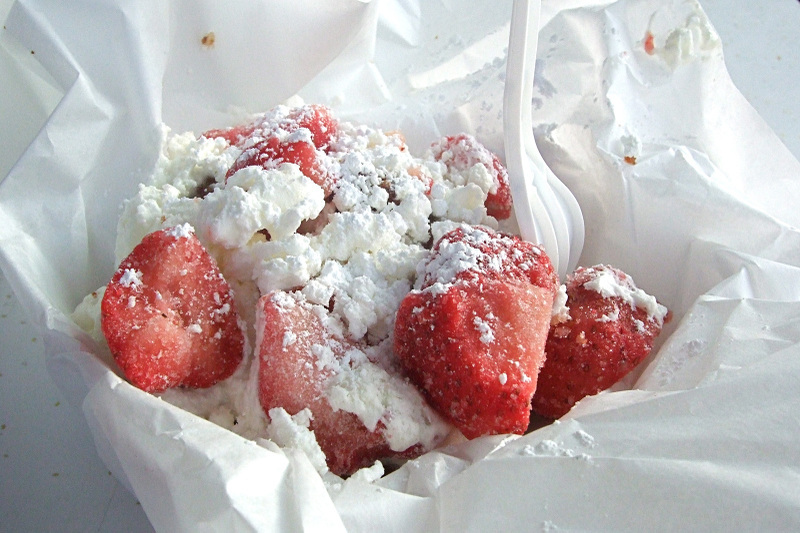 These chocolate-covered strawberries dipped in waffle batter where an early favorite to win our ribbon. 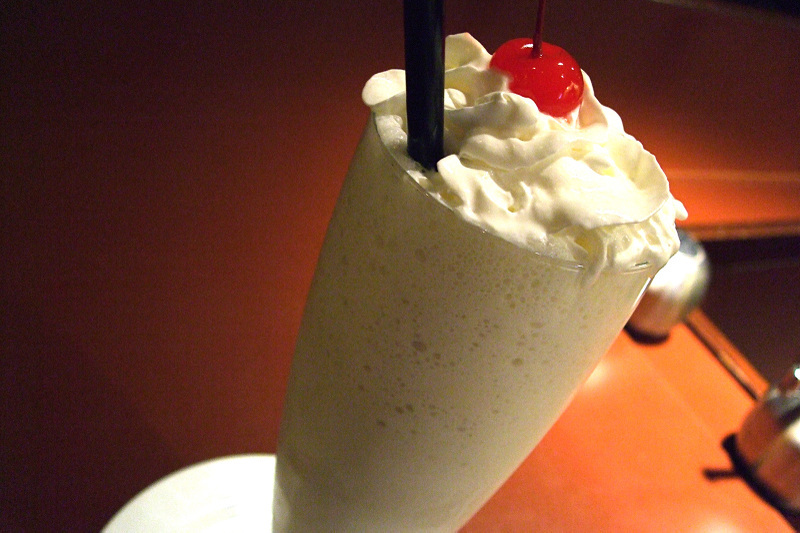 ^ Fire & Ice – "A pineapple ring is battered and deep-fried, then topped with banana-flavored whipped cream that’s been frozen in liquid nitrogen." 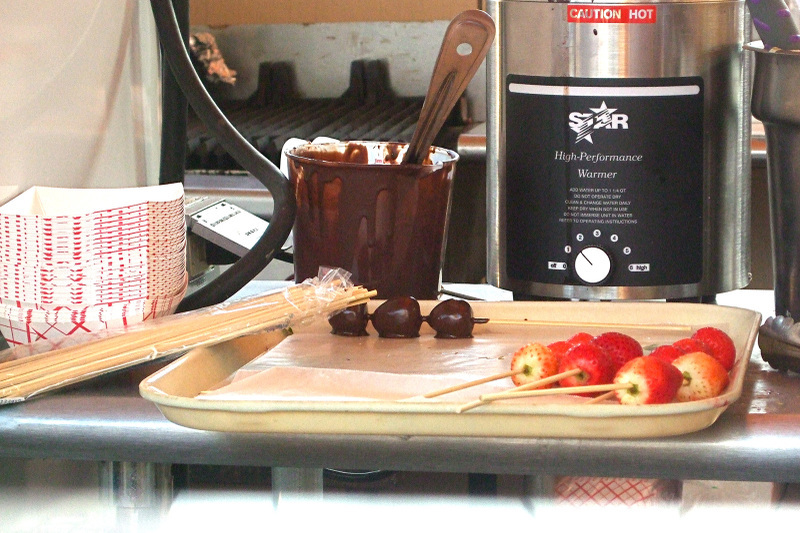 Pretty neat, but I dunno – On ours, the strawberries were frozen. In the liquid nitrogen? Refreshing though, with those super cold berries! 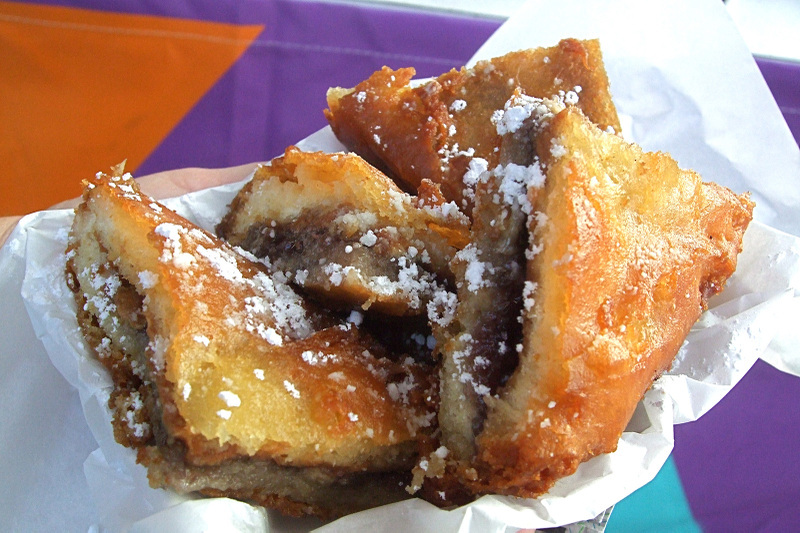 ^ Fried PB&J, with bananas. Yep. 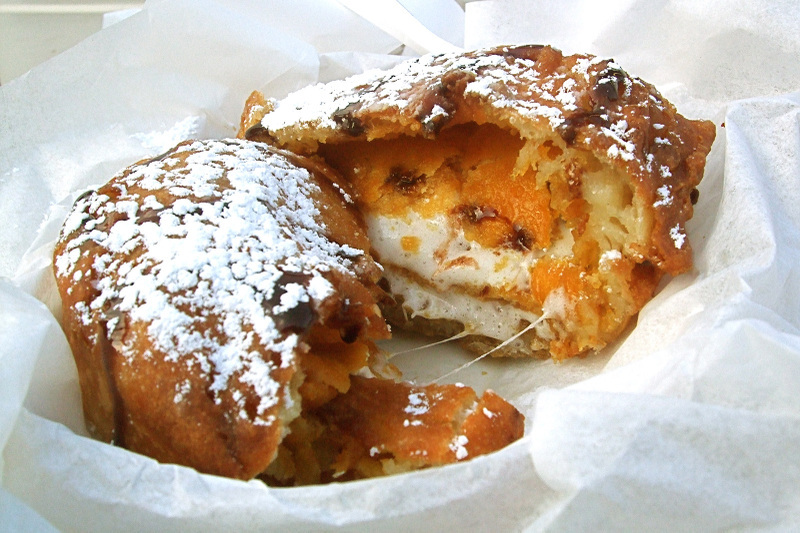 ^ I love Moon Pies, particularly the banana flavor… well, here's one fried up. 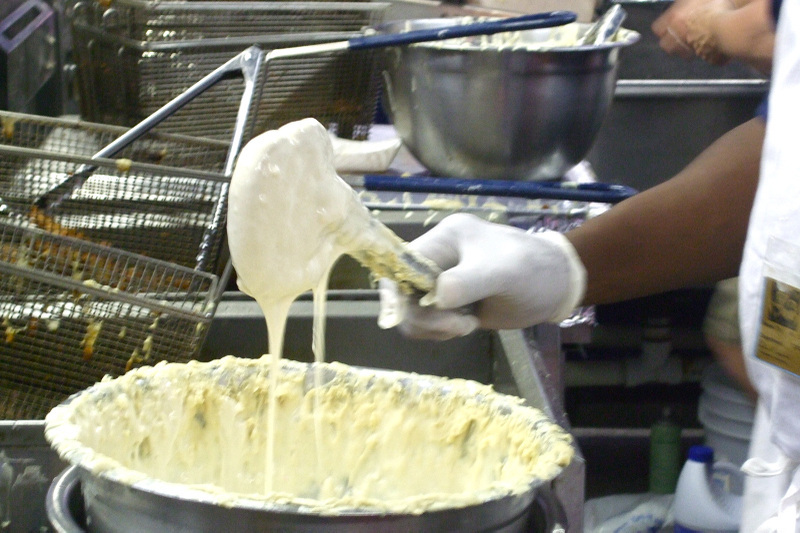 You can see it kind of just disintegrated in there – leaving molten goodness. 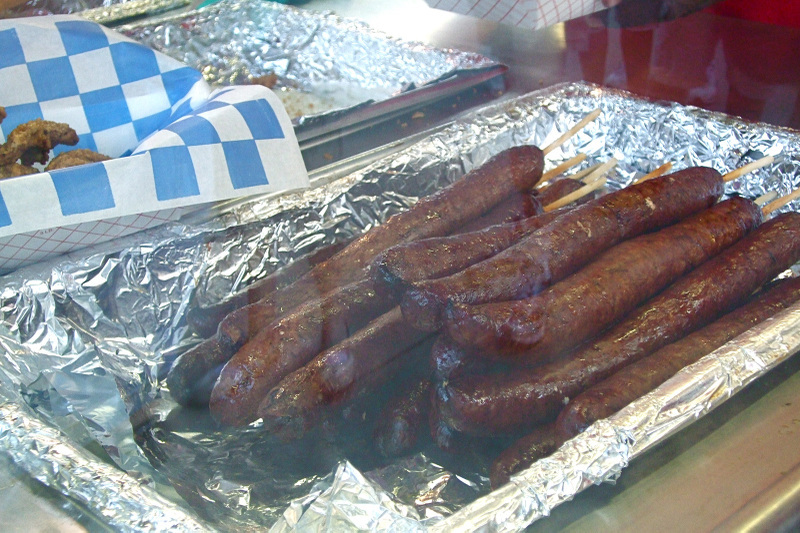 Time for a break from the fryer… Meats on Sticks! and some Turkey Wings. 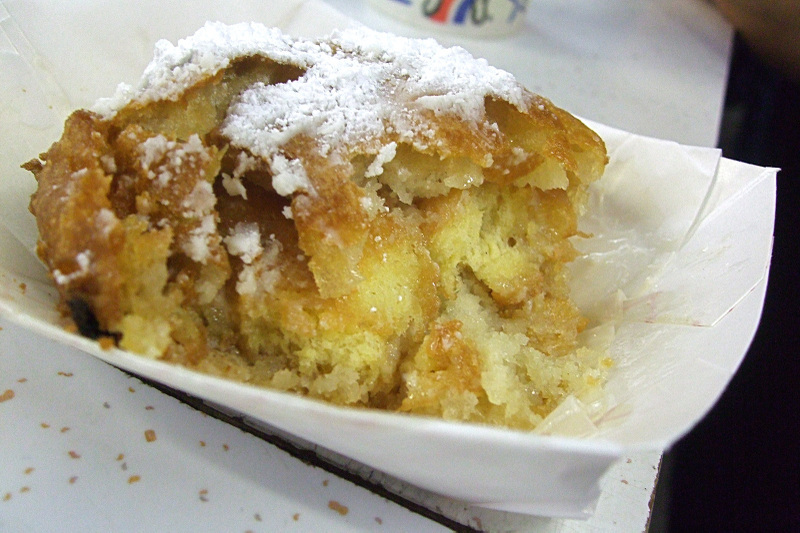 ^ Here was a real surprise: Fried Honey Bun – we fought over the rest of this one. 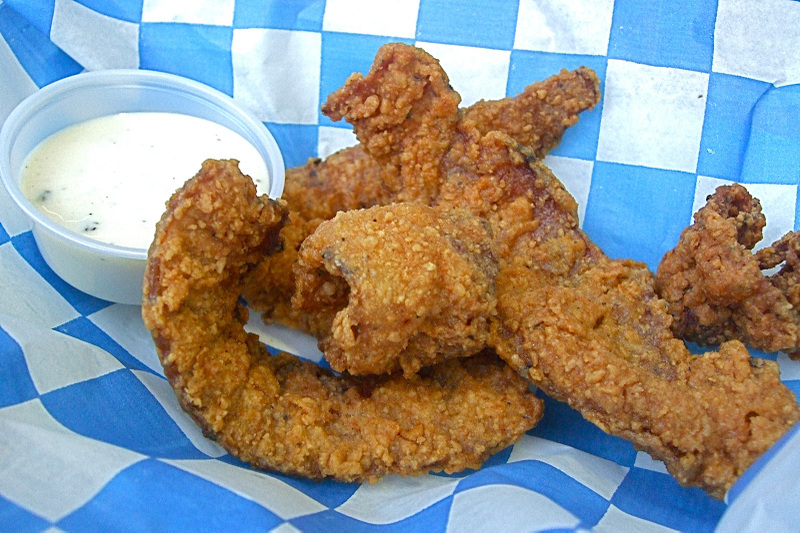 And finally – the Chicken Fried BACON, winner of Best Taste in the Big Tex Choice Awards competition… and deservedly so – man, GOOD STUFF. 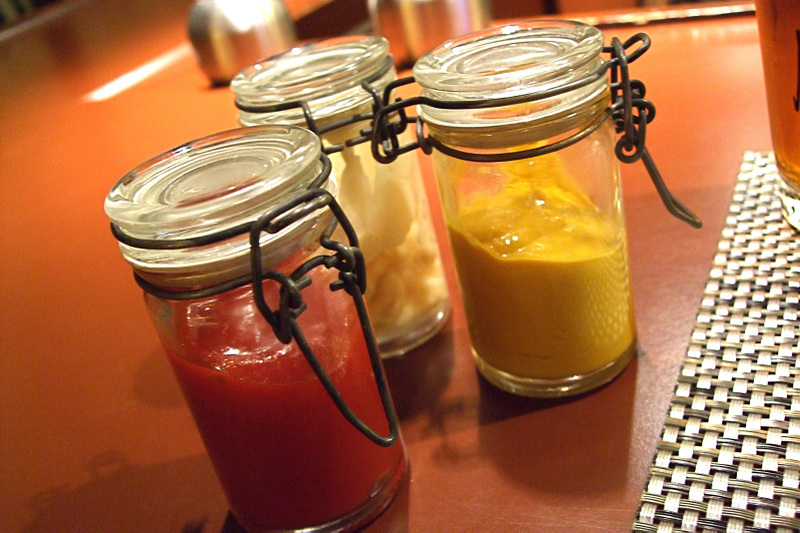 They provided all kinds of condiments: mustard, ketchup, ranch, honey mustard, etc. I added some Tabasco to the ranch dressing and just sent this dish over the top. Crazzzy! 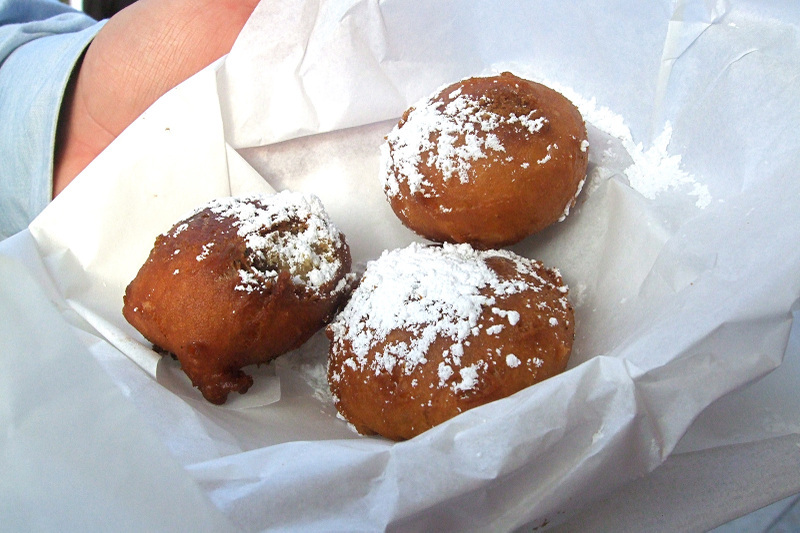 That's all we could get in on this trip – but there are many more fried delights to be had. If I recover, I'll head back in a couple weeks. I went by The Mansion last weekend and got to taste the new desserts… We devoured them all! 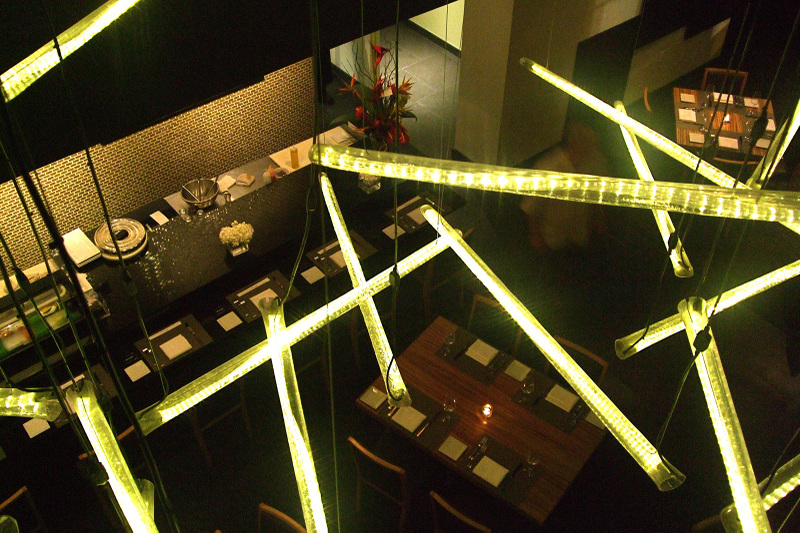 Chef Tesar's personality is quite evident in the clever Crème Brûlée 2.0 (here is a bar-light sneak peek). David Collier is pastry chef at The Mansion. 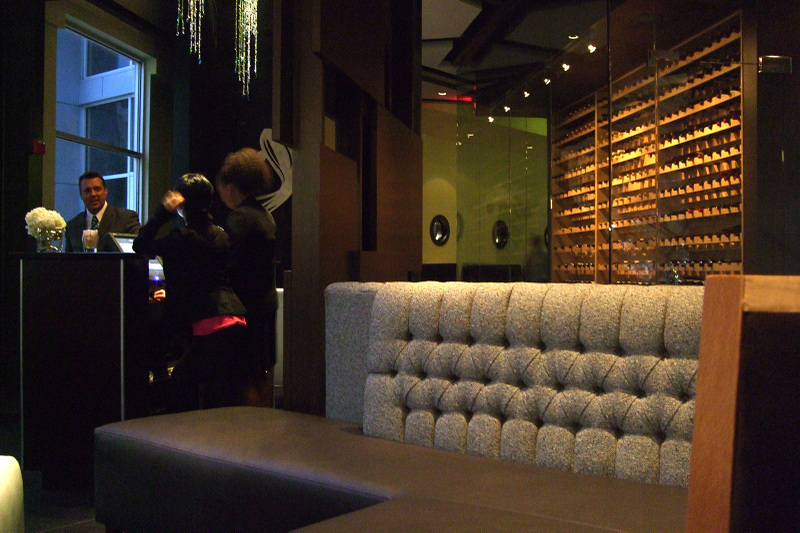 Stay tuned, as I will soon be back with a gorgeous photo essay featuring many of the new dishes and Chef's Room/Table delights! 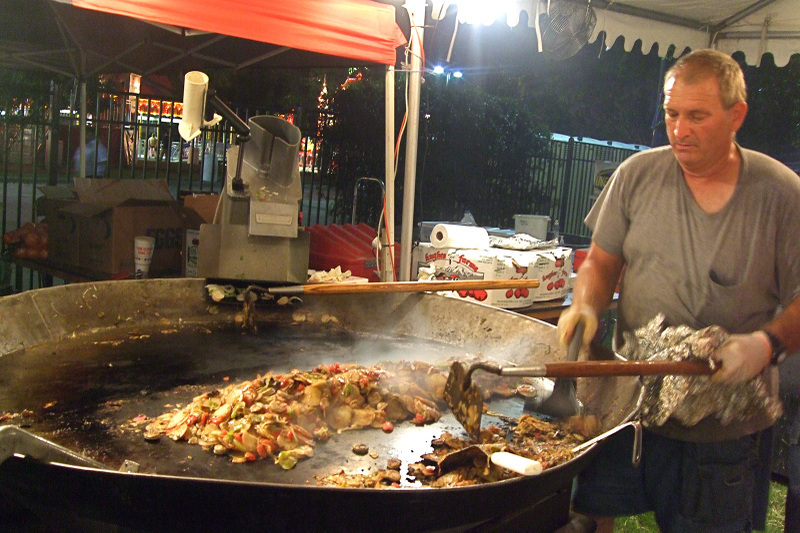 Here’s The Man prepping a new batch: a pound of butter; freshly sliced potatoes; then tomatoes, onions, green peppers, spices and finally – sliced sausages. 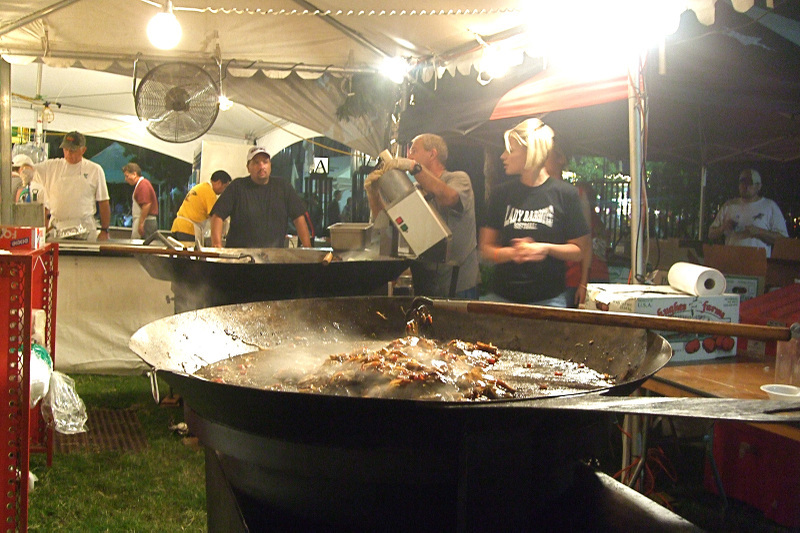 grill for next year… whatever, this ritual is all part of the fun! With these few simple ingredients, I can make magic in a pan! 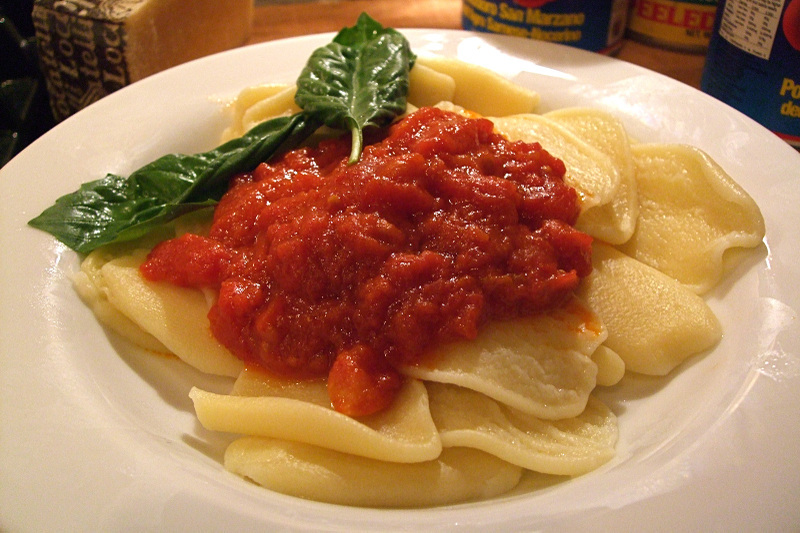 Being of "I-tralian" extraction, I am very picky about what goes on the pasta or whatever else, be it sugo or salsa ("gravy" or "sauce"). 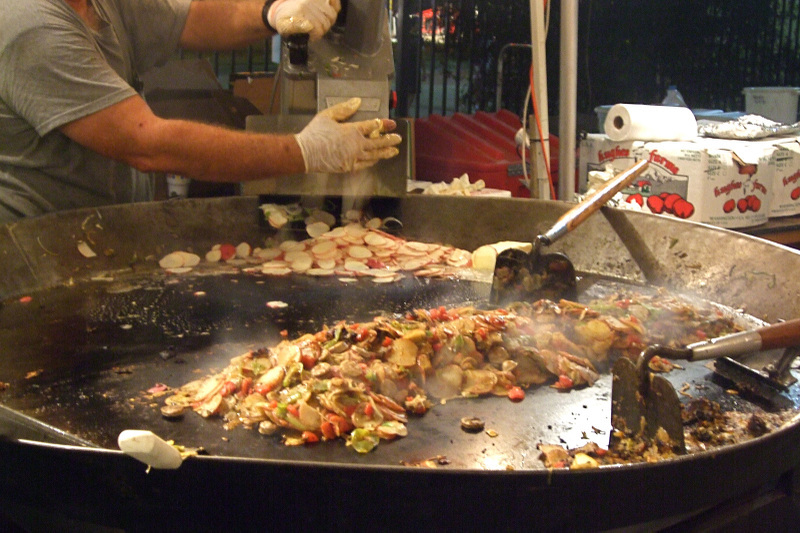 Sugos are generally rich meat-based sauces, like a Ragu Bolognese, while salsa is a more liquidy or even raw sauce. 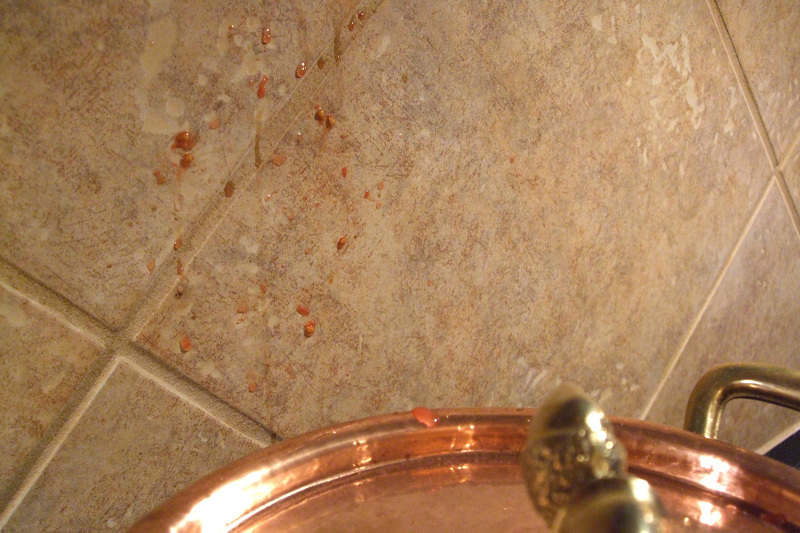 My Mom still guards the sauce recipe taught to her by my paternal grandmother, so today I am preparing my own concoction – a ridiculously simple and unbelievably delicious salsa. 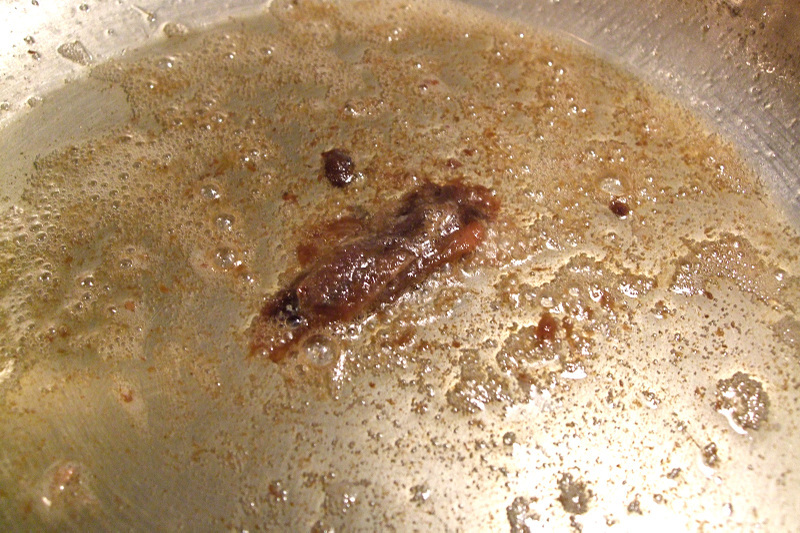 I can’t believe I’m divulging my secret, but here goes: start off by dissolving an anchovy fillet in a bit of olive oil. I know, I know – everybody hates anchovies – well you’ll never know it was in there, and it provides all the salt for the dish as well as an earthy depth that you can’t quite put your finger on. 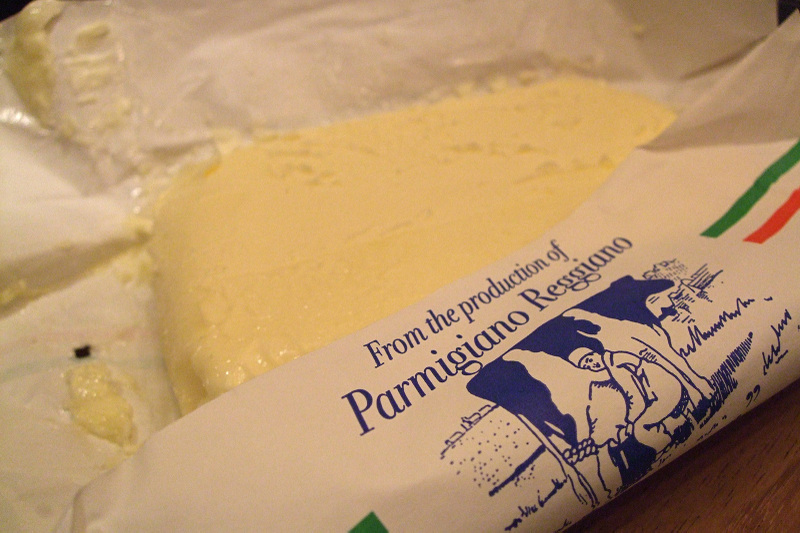 Then butter in place of the remaining olive oil… heh. 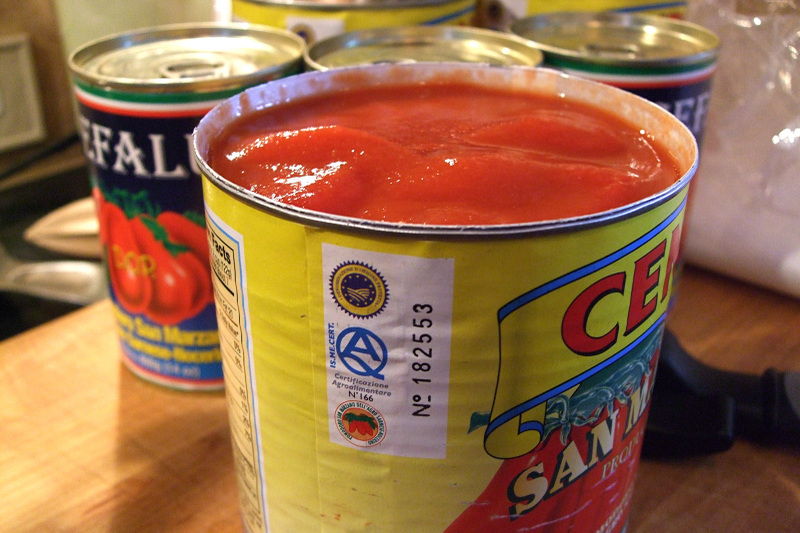 Now, just a big can of plum tomatoes – but not just any kind. 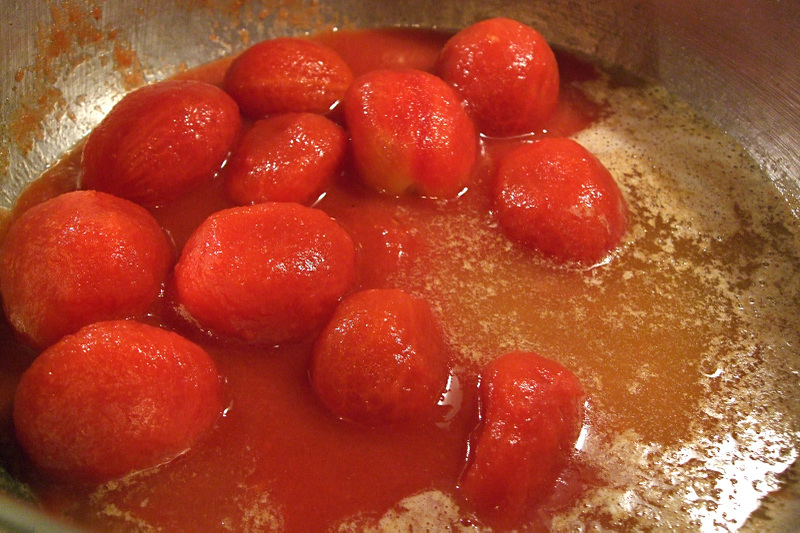 We need San Marzano tomatoes: grown in volcanic soil in the shadow of Mount Vesuvius. This time out we are kinda doing a taste test. 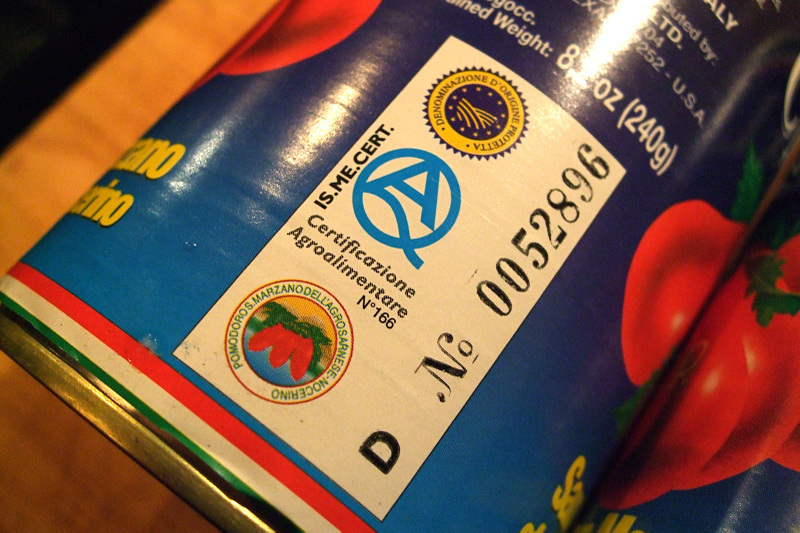 Various brands label their tomatoes as San Marzano or San Marzano "Style," but the real deal is designated by the D.O.P. label. 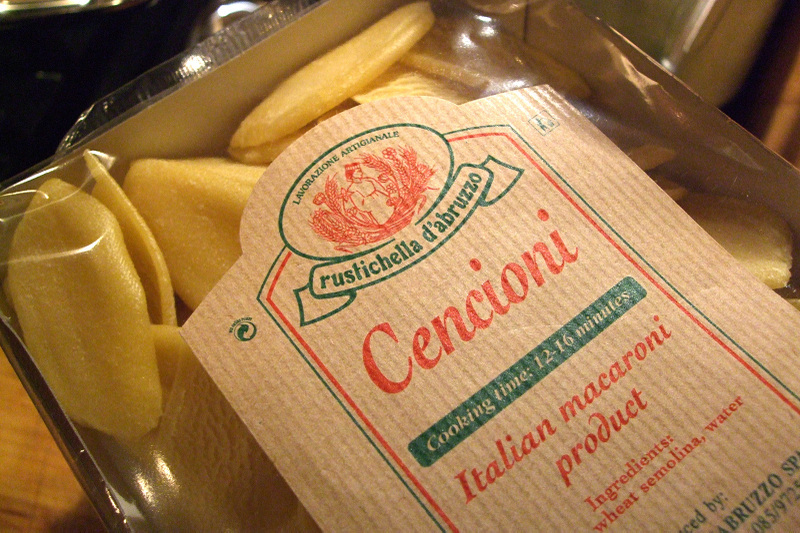 This guarantees that they were grown in the protected geographical region near Naples. Above are two brands that are actually D.O.P. 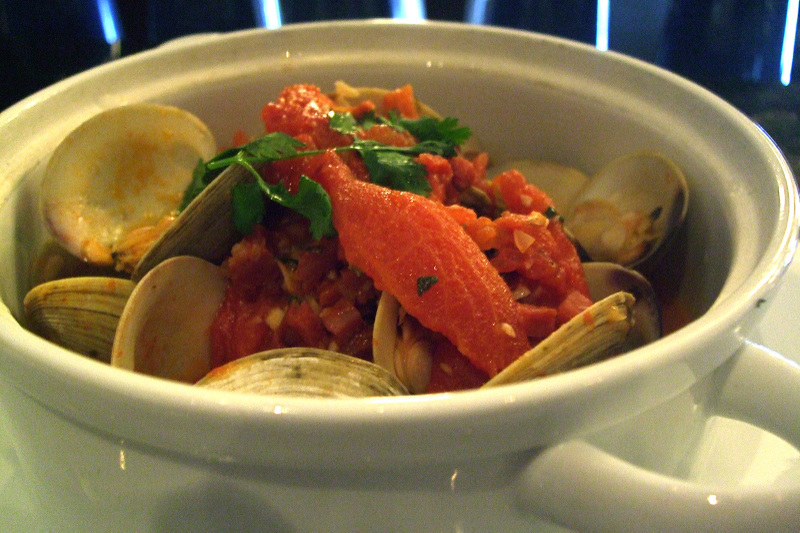 (Cefalu and Cento San Marzano, though many consider LaValle to be the best, they were out at Jimmy’s on a recent trip.) 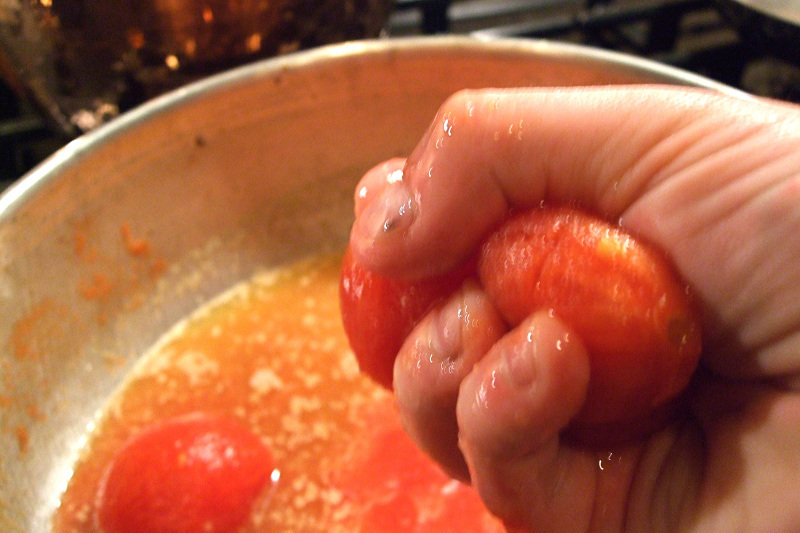 The photos at the top of the post show a type of San Marzano Style tomato grown in the US – without looking closely, you would assume they were from Italy. I made my salsa twice, first with the domestic variety and then the D.O.P.s – just to see if it was worth the trouble to go with the good stuff… it should come as no surprise that the Italians prevailed! 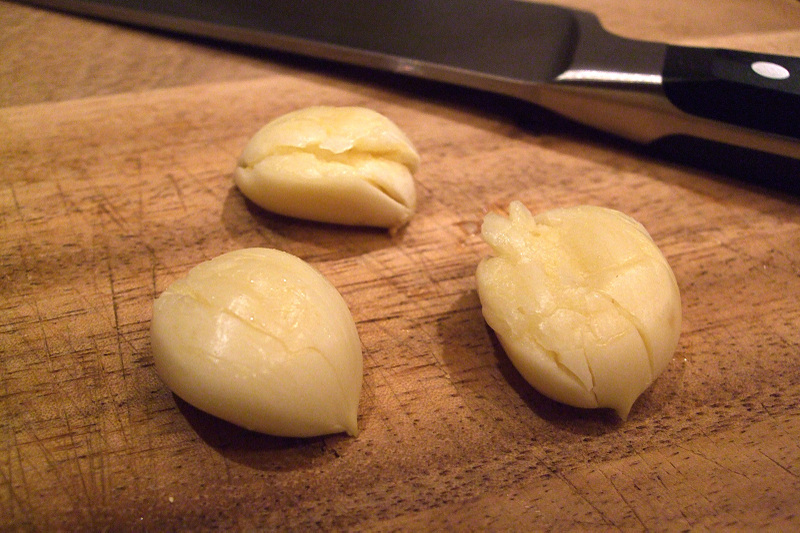 Back to cooking: now just smash a few garlic cloves and toss them in there. 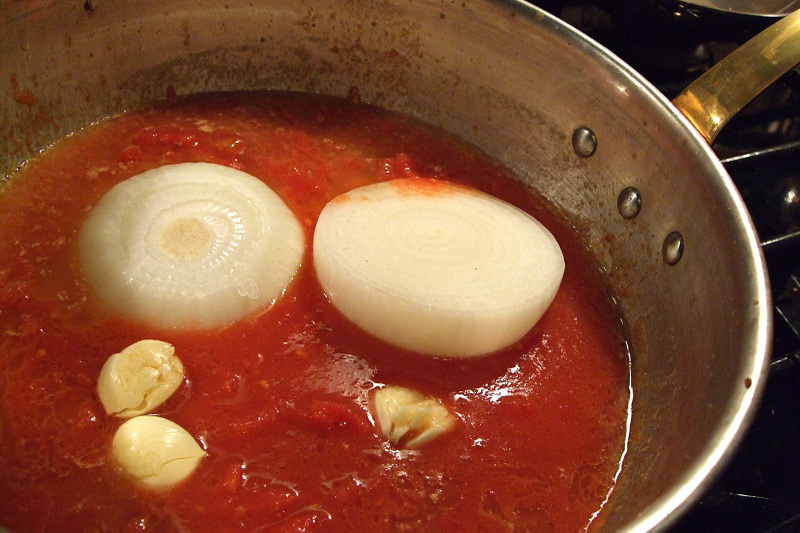 And the great onion trick from Marcella Hazan: cut a whole yellow onion in half and throw it in the pot – the onion adds all the sugar we will need. 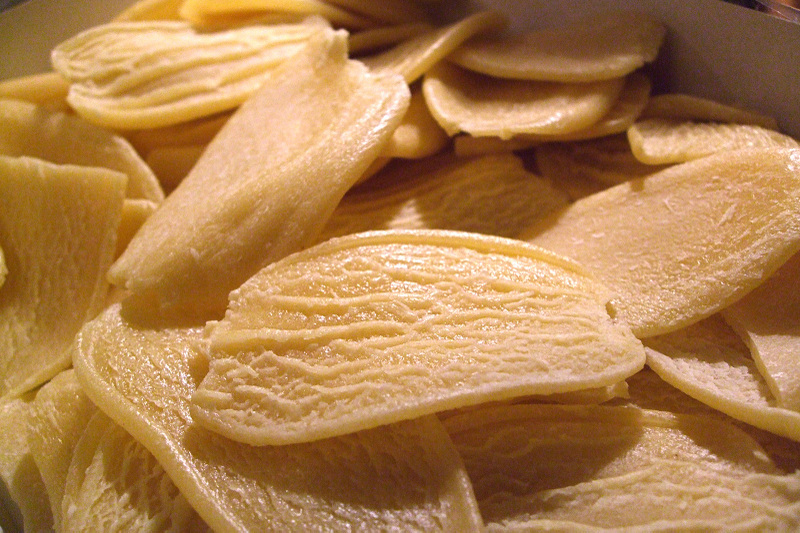 Try a different kind of pasta, like maybe Cencioni: a petal-shaped pasta, larger and flatter than orecchiette. 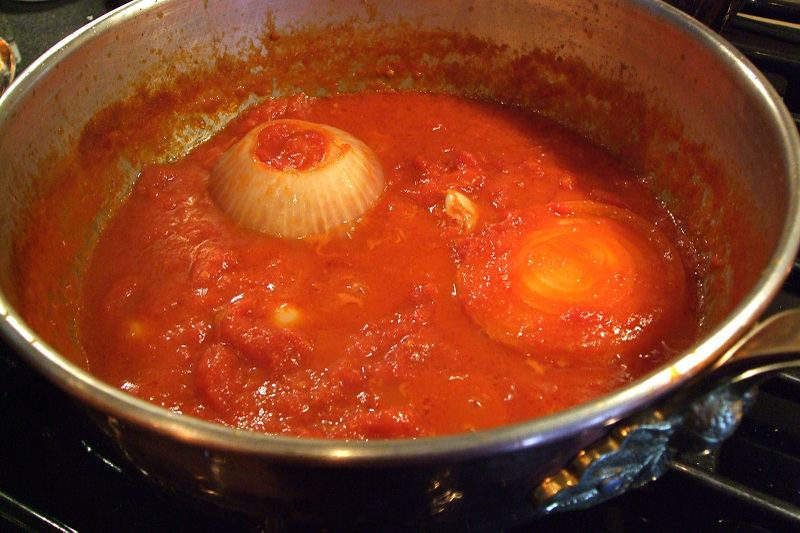 One side has a rough texture which helps the sauce cling better – really good stuff. 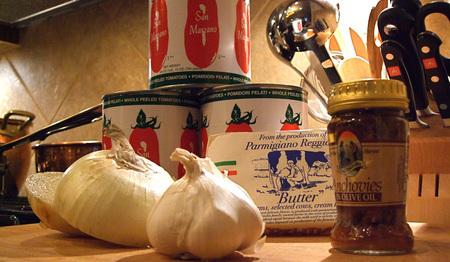 great on the side, btw) and fish out the garlic cloves if you want. 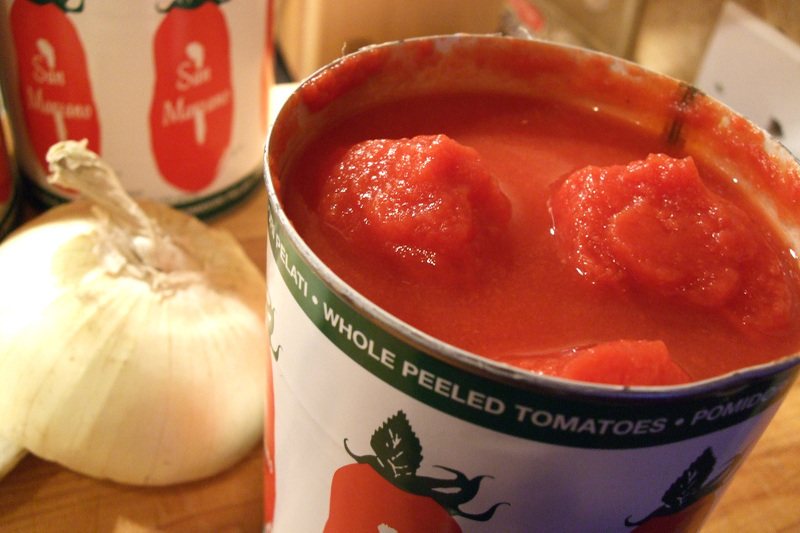 Done, it tastes amazing – all about the tomatoes. Go forth and "Manga!" Click the logo for the Walken clip, then poke around the site. This also led me to Under the Tuscan Gun, where you will find a foodie blog and cooking webisodes from Debi Mazar and her husband Gabriele Corcos. Fun! 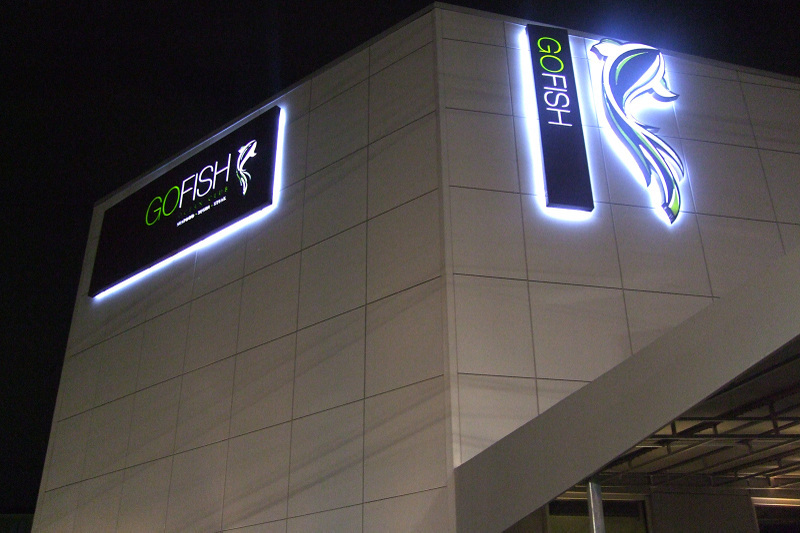 I've seen some confusion on the Inter-Webs re: Go Fish's latest incarnation. As it is in my general vicinity, I decided to do a re-con mission. 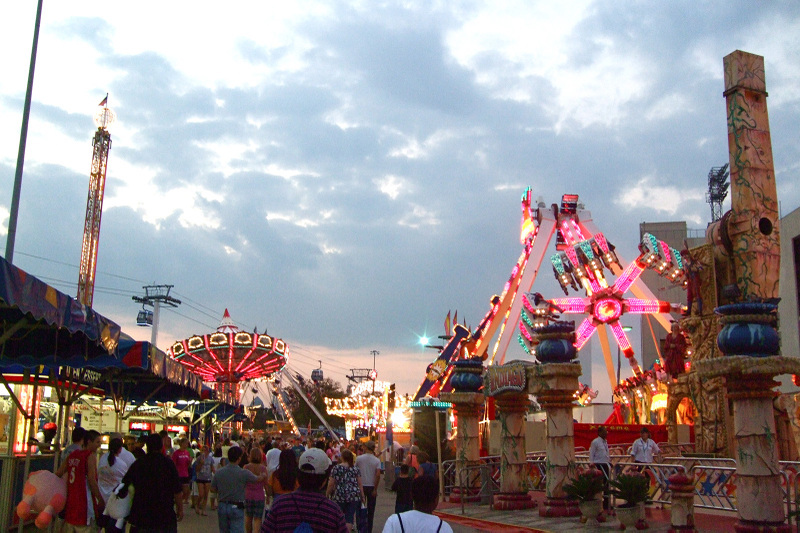 Fact: They are in Pre-Open mode, a few dramatic details are yet to come on-line. True: It is in that God-forsaken hard to find Village on the Green development. 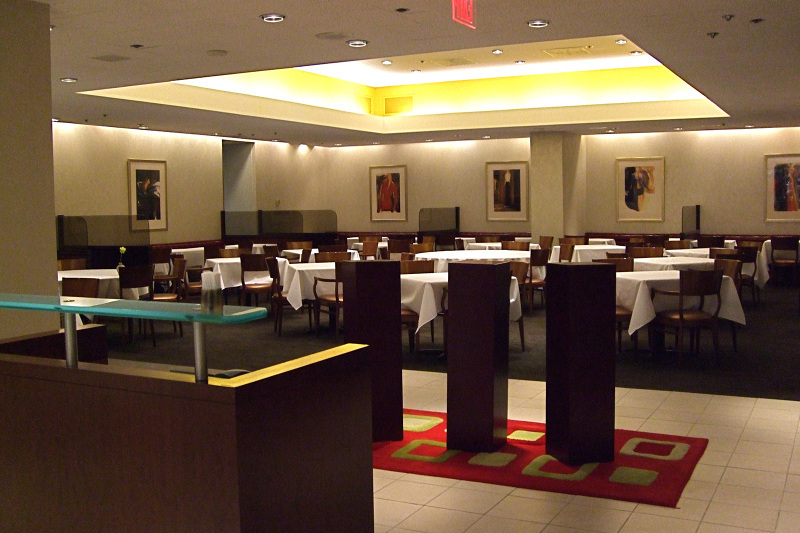 False: They are in the old BLT Steak space. True: It's a pretty cool venue. 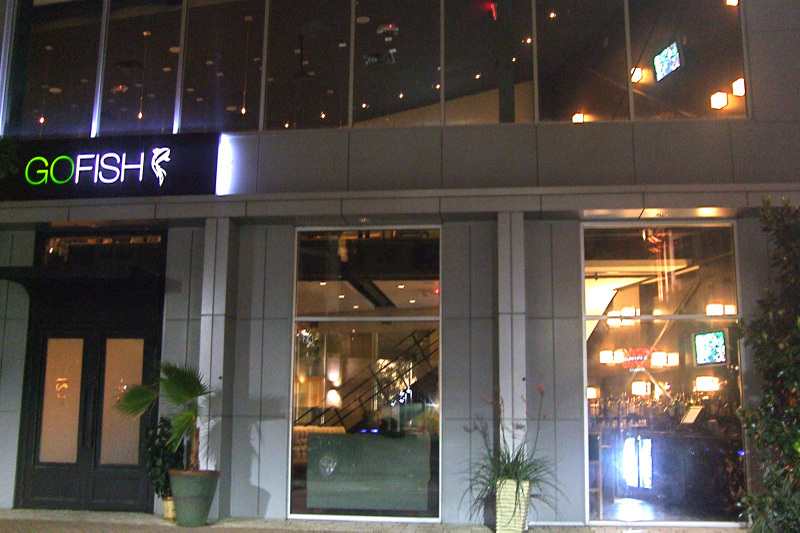 In fact, Go Fish Ocean Club is located in a beautiful space across the plaza from the former BLT Steak (which will soon house a concept from the Maguire's folks). The Village on the Green is just now taking shape with Rocc and Capriccio having recently opened for business. It seems that with some traffic, this area could find its sea legs. Obviously not a One Arts Plaza, but there is a welcoming feel to this little urban development. 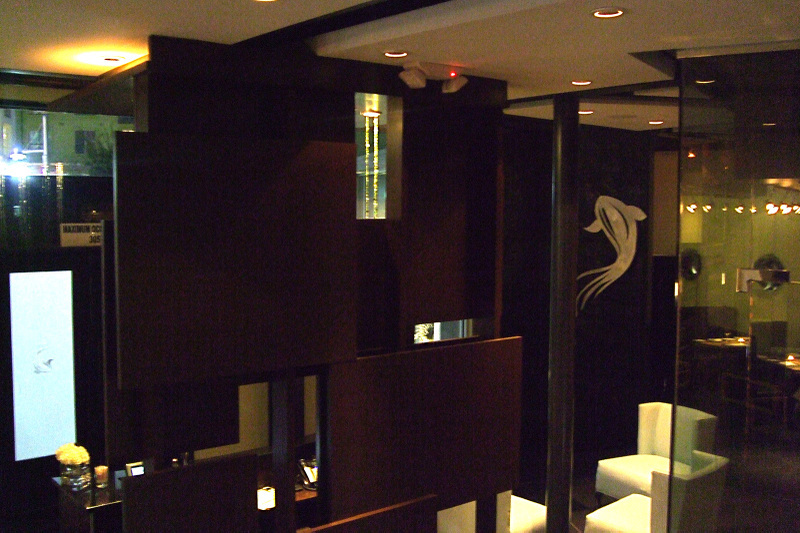 They JUST opened the doors, like last week, and had some action over the weekend, but will soon start the PR machine. 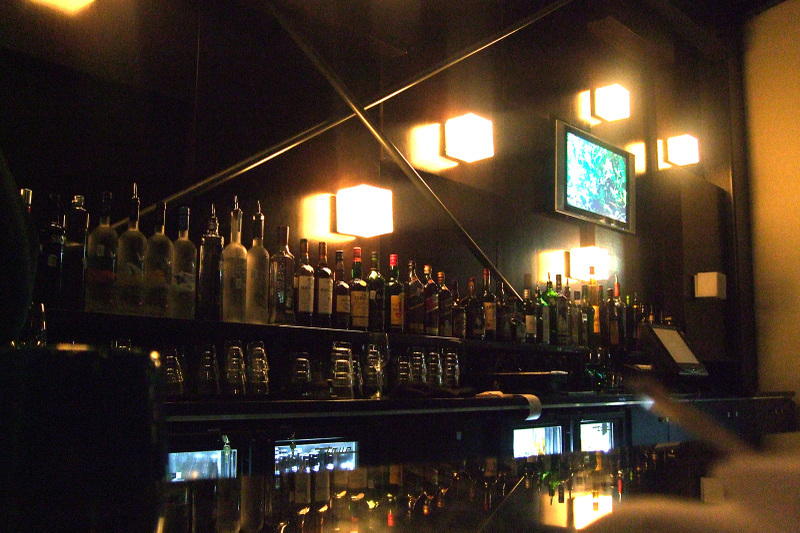 I snuck in Monday evening for a cocktail and had a chance to chat with some of the staff, including Will – my very personable bartender. One of the guys saw me playing with my new camera and took me on a little tour around the handsome space. 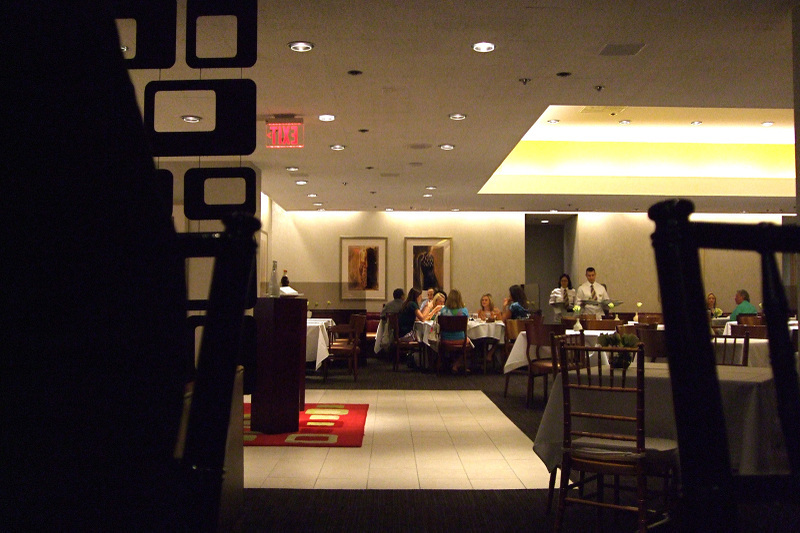 ^Looking into the main Dining Room. And the dramatic two story waterfall (water coming soon). ^Upstairs: The Captain's Room…and The View – very unique setting north of LBJ. Nice. There is a second bar up here and they are going to project old movies on one large wall (here we see a test – they plan to have this image fill the wall) it's all visible from the plaza, a great visual and really not that gimmicky here – it's kinda cool. 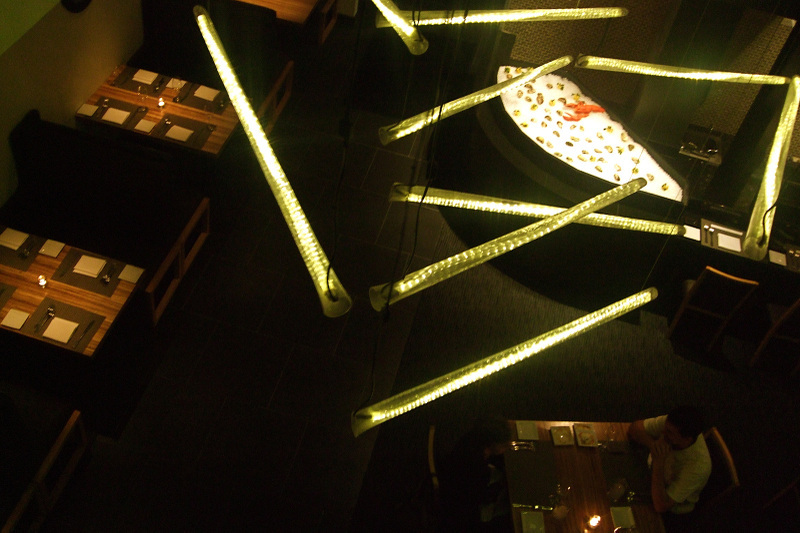 ^Looking down into a sliver of the Dining Room w/ the Raw Bar to the right; and the Sushi Bar. 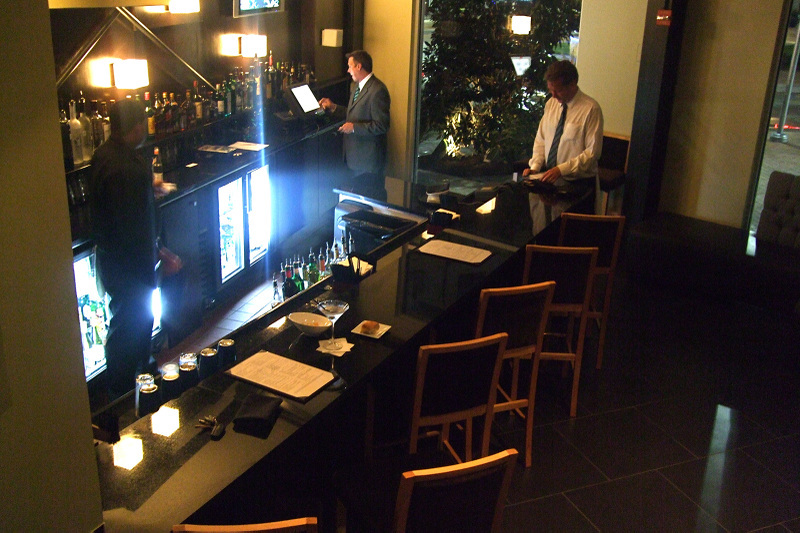 ^Down into the Main Bar; the Lines, three stacked – the last for catering. 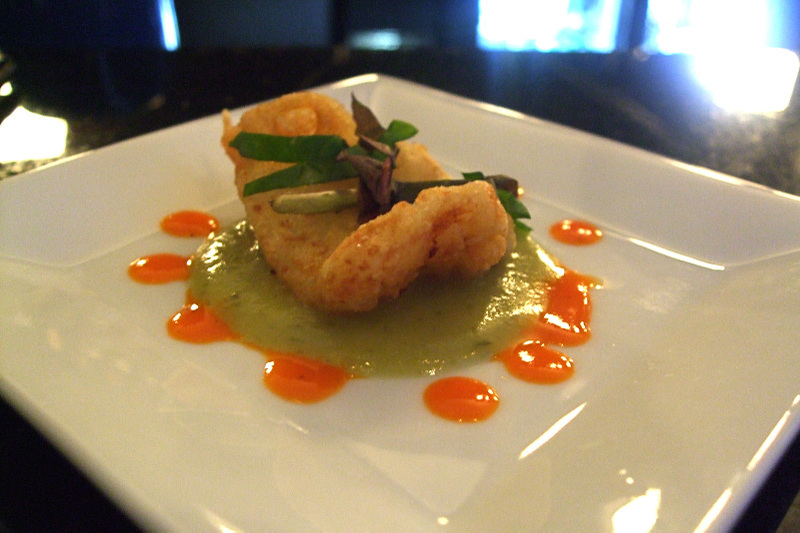 To go along with my football, I receive an amuse from the Chef – a little Scallop Tempura. 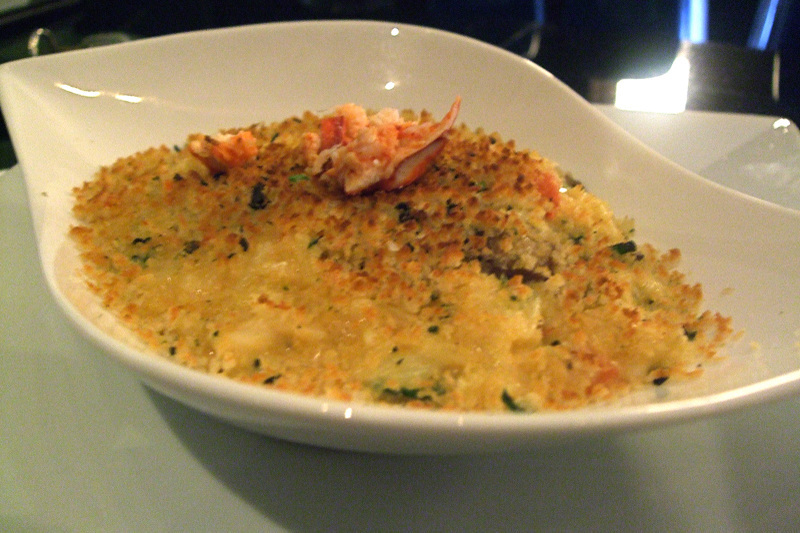 ^I enjoyed the Clams with Chorizo Broth; and had to try this side: Lobster Orzo "Mac 'n Cheese," better paired with an entree – perhaps the "Cowgirl Steak" I spied on the menu. 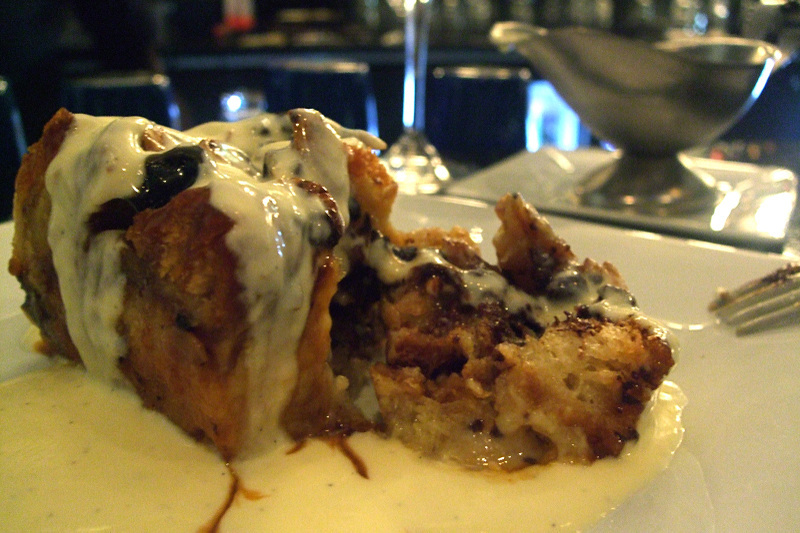 The very lovely Tiffany Derry (Executive Chef) dropped by to entice me into a dessert – she loves the Key Lime Pie, but I had to give the Croissant Bread Pudding w/ Crème anglaise a whirl. 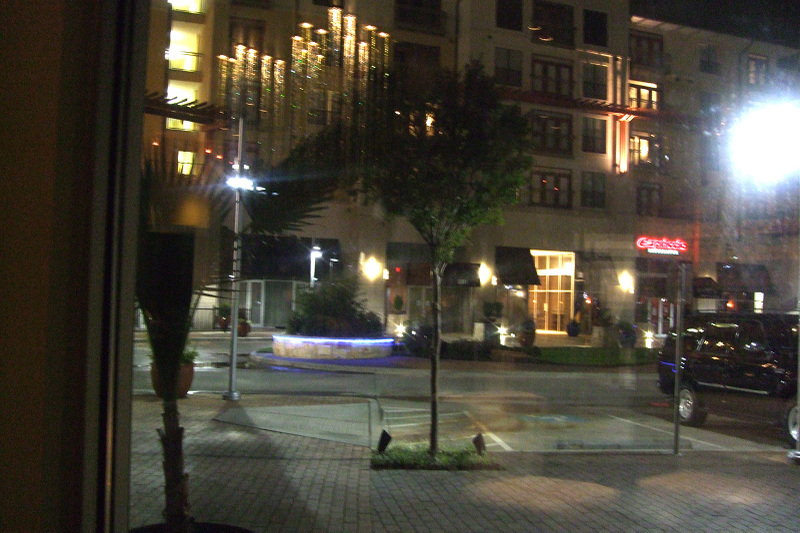 A view from the plaza; and the old BLT Steak across the way. I was very happily surprised by this room – there are some dramatic additions to be added to the dining rooms, and the Patio will be open soon as well. Shaping up guys! I LOVE Las Vegas. Among its many charms, gambling runs a distant third for me. Shenanigans rank, for sure, but I have literraly made trips to do nothing other than EAT. I will be posting more on this subject soon, including what I consider to pretty much be the coup de grÃce (don't even think of not indulging in the 16 courses). 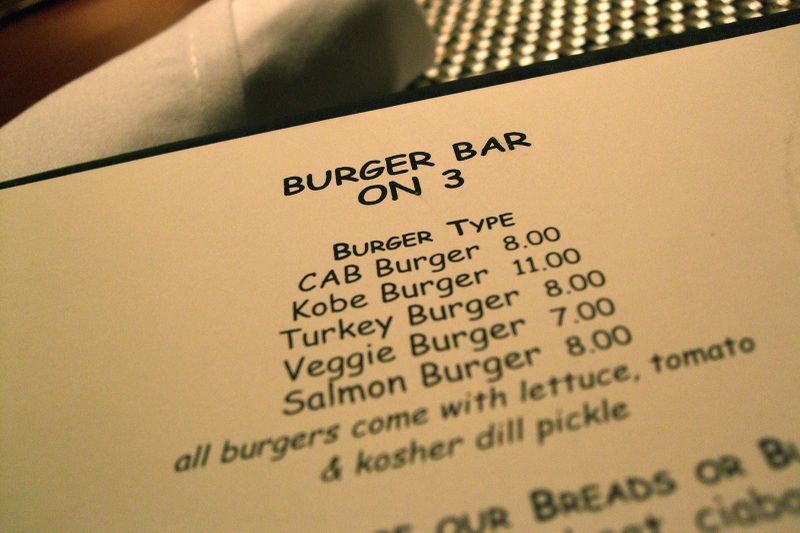 A (not so) guilty pleasure, though, is Hubert Keller's Burger Bar in Mandalay Place. I always find time to squeeze this place in – and if not dragging a newbie or previous convert along, it serves as an excellent hangover cure… solo. I was recently discussing the virtues of this joint with Tim Love, who runs (among other venues) Love Shack in Ft. Worth. He's got his own ideas on the subject and demanded I venture west and check out his place. I intend to do so… well… Forth With. In the meantime… Let me share another discovery. But first: the subject of hamburgers illicits much passionate debate on the web, and there are better places for that discussion. 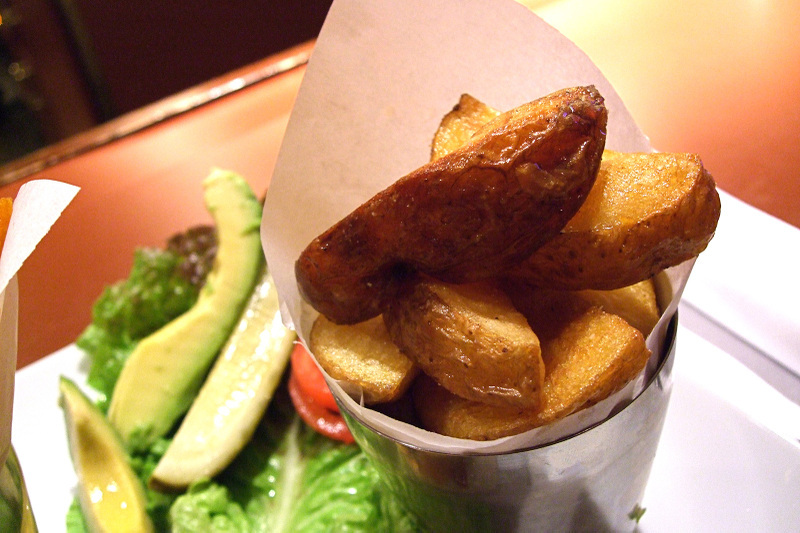 Here, we are talkin' about high falutin' – fancy schmancy – silly-expensive burgers. 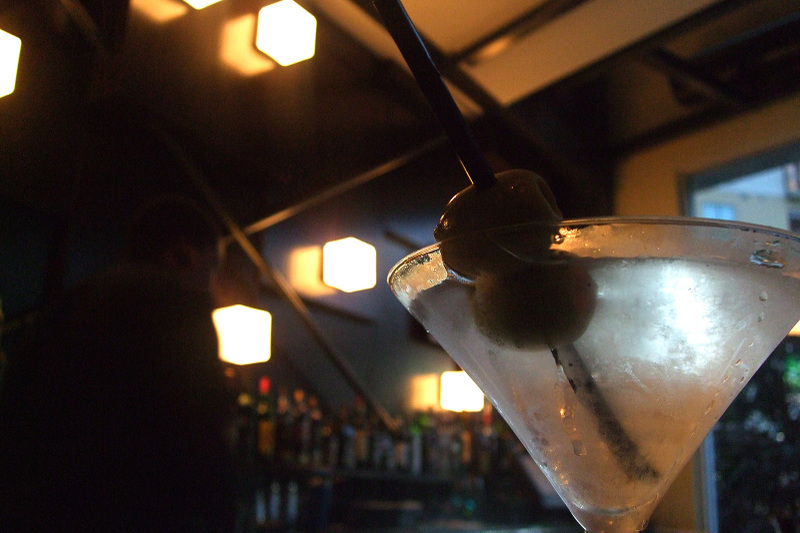 I was just happy to come across a reasonable facsimile of my Vegas indulgence, right here at home. The setting even adds to the illusion. 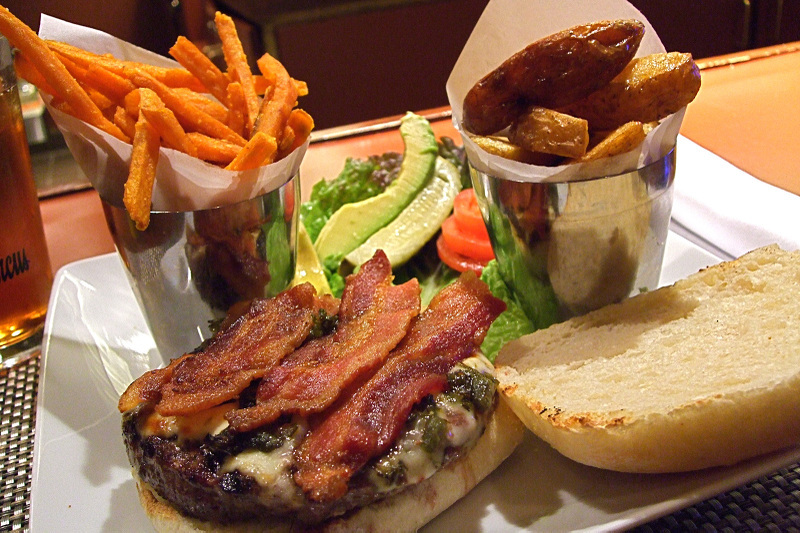 Tucked into the corner of NM Cafe on the Third Floor of Neiman-Marcus NorthPark, find Burger Bar on 3. 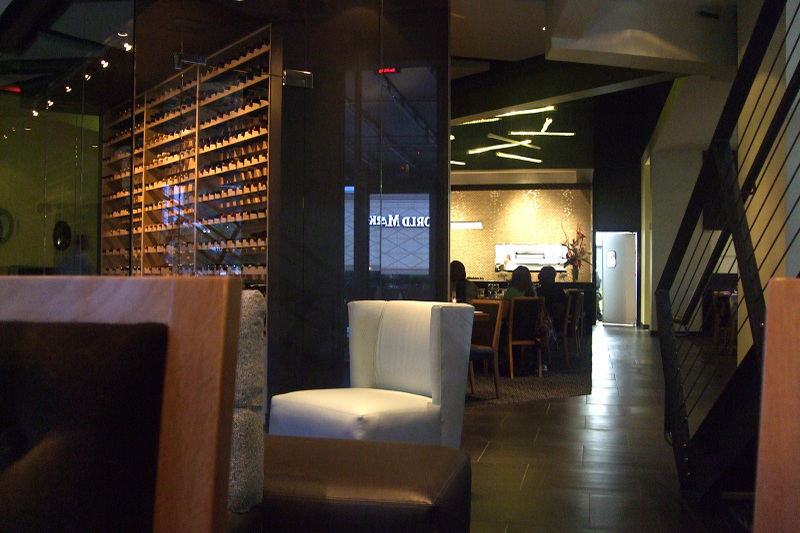 ^ NM Cafe… and looking into the dining room from Burger Bar. 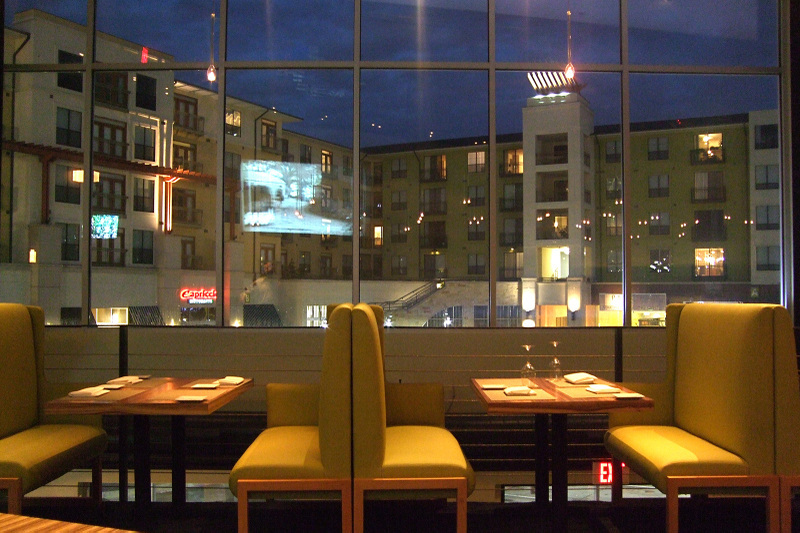 With the new expansion to NorthPark, the mall that we've loved for decades now has a grander presence – and even more decadent window shopping opportunities – the closest thing to Vegas in these parts, anyway. little jars. I sprung for some Chipotle Mayo as well. refreshing. Not a bad thing. There you have it. 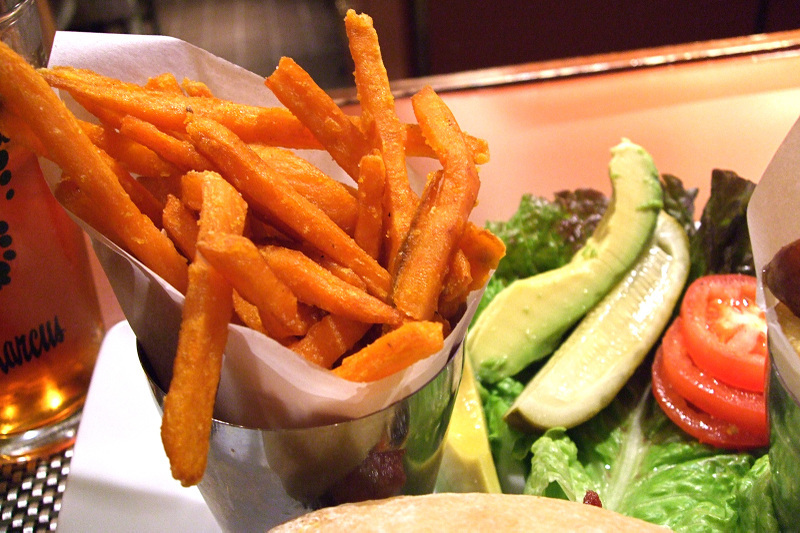 Thumbs up from me – but for reasons beyond just a delicious burger. 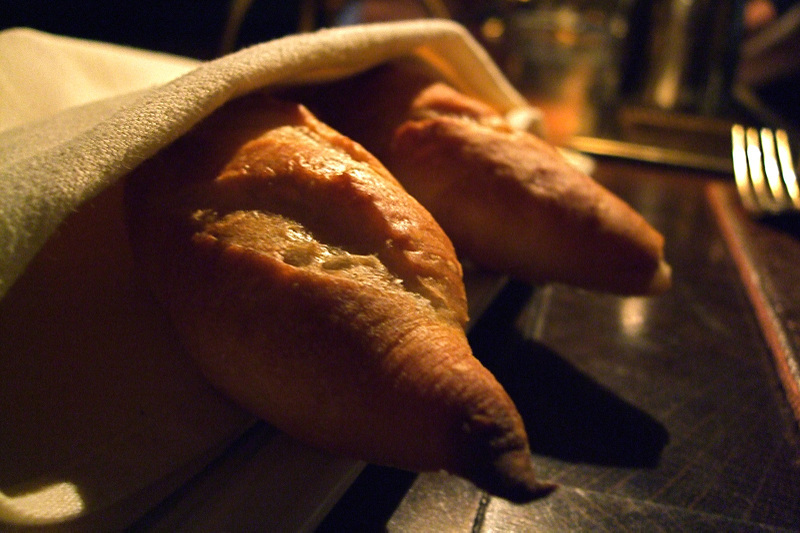 My buddy John Tesar is back from his food-gasm inducing trip to Europe. 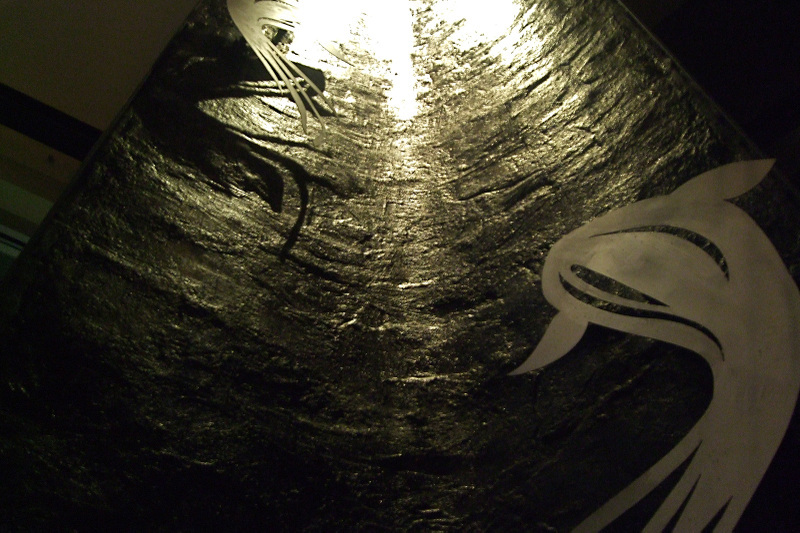 If you missed his blog posts, it’s worth taking a look. 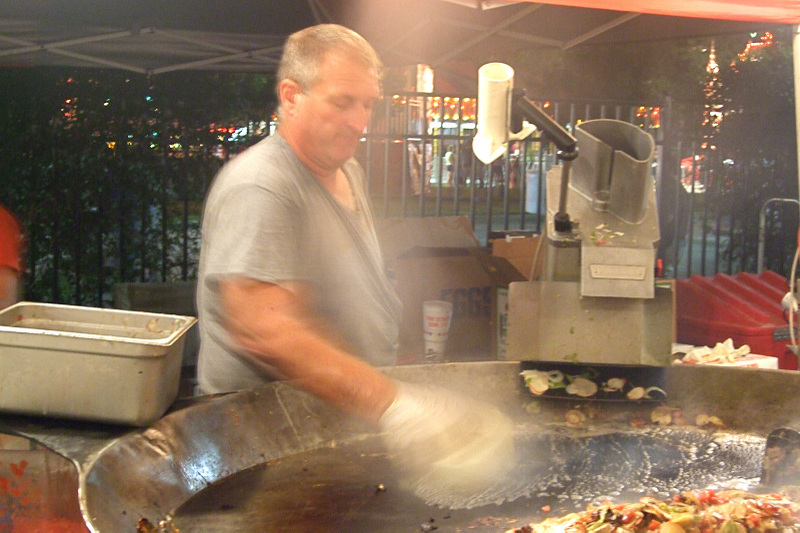 He recently hit France, Italy, and the new Mecca of gastronomic inspiration – Spain. While discussing his travels, one hears tale of moments of true magic. The clarity that comes from experiencing the perfect environment. 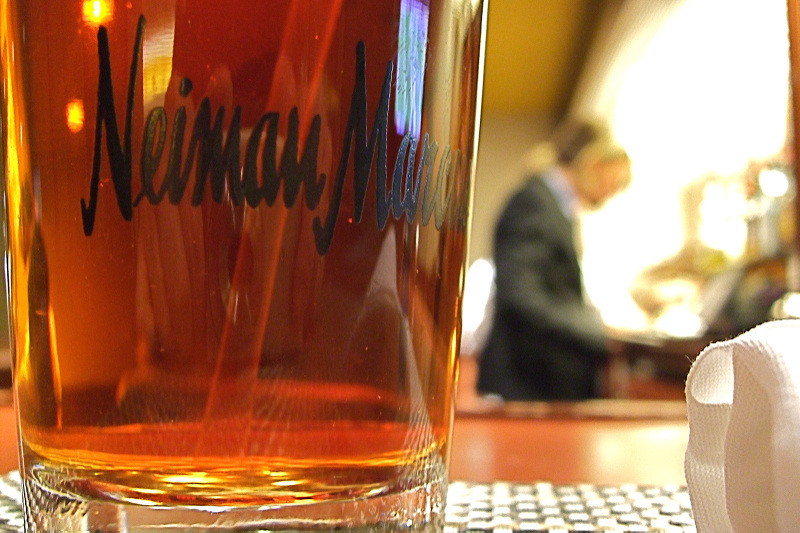 Sights, sounds, smells – each influencing everything that you taste. There are many benefits of having a friend that loves food even more than yourself (not to mention one that has a pretty sweet sandbox to play in.) Among them is that once in awhile he runs into the kitchen, you know – just to add substance to the discussion. Well, right after he got back last week, we had time to BS one evening. Here are a couple wonderful “moments” I enjoyed. 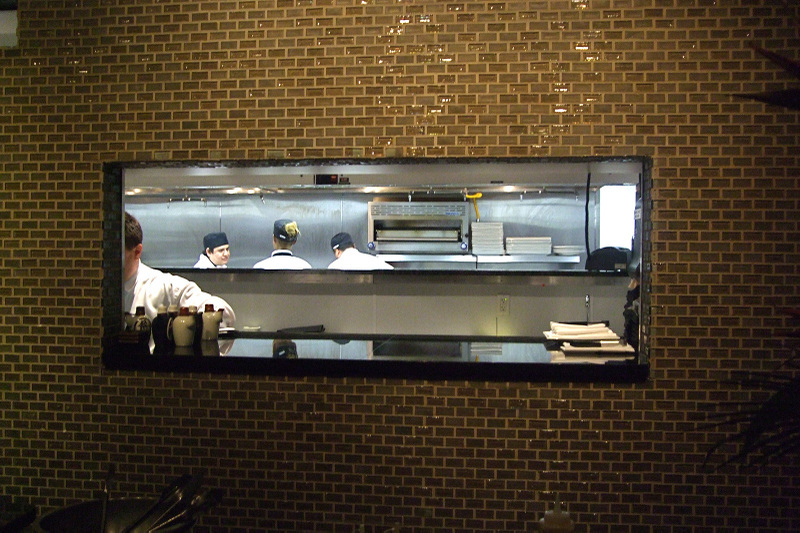 Chef has some exciting plans for the fall menu, up and down the various Mansion dining options. These were just for fun, we’ll have to wait and see what he has up his sleeve. ^ Left: Mansion Gravlox w/ Apple, Cucumber and Dill – classic. 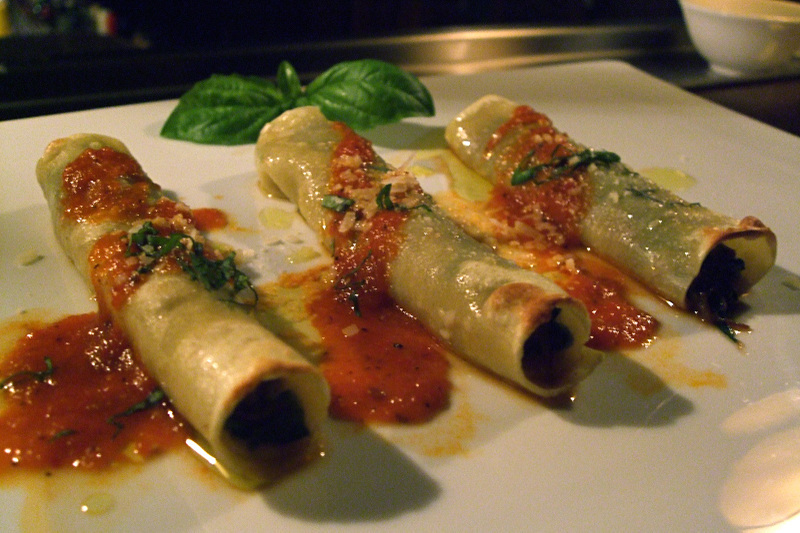 Right ^: Cannaloni w/ Short Ribs, Borage, Pecerino Cheese, Tomato and Basil. The kicker on this one was a glass of Montipulciano from the Masciarelli Family of Abruzzo. It was magic. 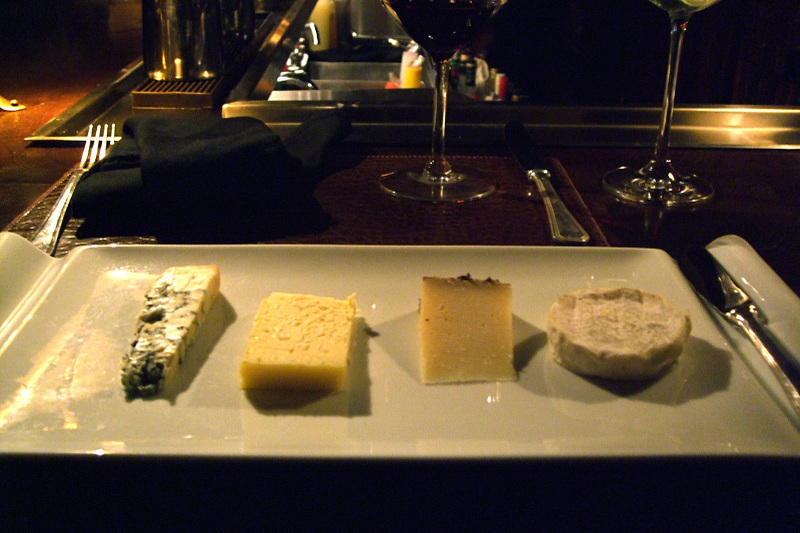 And, of course, some cheese – It could be worse, my friends…!